Perform on-site quantity take-offs and cost estimates! Record field measurement estimates using the power of augmented reality (AR). Capture accurate length, area, volume, and weight measurements from scale drawings and satellite images. Assign customized cost templates and create instant cost estimates for yourself or your customers. Create a Project to keep your quantities and estimates organized. Record field quantity estimates for length, area, and volume and visualize them in 3D. You can even measure from scale drawings and satellite images. Add other known quantities to your project to complete your take-off. Record known measurements, item count, or include a percentage cost allowance for contingency or profit margin. Assign reusable cost templates to your quantities to create instant cost estimates. Cost templates are completely customizable. Make final adjustments and then export the estimate to yourself or to a customer. What devices can run QuantifyAR? You will need an iPhone or iPad with an A9 processor or better. This includes iPhone 6s, iPhone 6s Plus, iPhone SE, iPhone 7, iPhone 7 Plus, iPhone 8, iPhone 8 Plus, iPhone X, and iPad pro models. 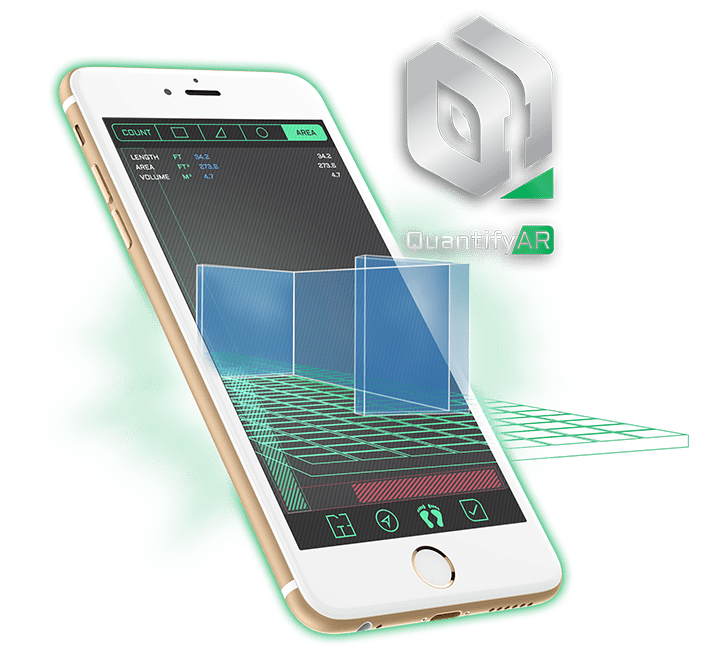 You need to be running iOS 11 or newer in order to download QuantifyAR from the app store. Does QuantifyAR take accurate measurements? The accuracy of field measurements taken with QuantifyAR depends mainly on the AR tracking capabilities of your device. The newest iPhone models (such as the iPhoneX) are designed specifically for AR tracking and should deliver the best accuracy. We recommend that field measurements taken with QuantifyAR only be used for initial budgetary cost estimates and not for actual construction. How can I improve the accuracy of the measuring tools? We recommend using the newest iPhone or iPad that you can afford for best AR tracking and measuring accuracy. Avoid holding your device near the ground while walking. This makes it difficult to maintain accurate AR tracking. Avoid aiming your device directly downwards while moving. Rather, aim it in the direction you are moving. Are measurements taken from imported drawings and satellite images accurate? Yes! If you properly set the scale of the drawing when importing, the measurements will be highly accurate. Of course, the drawing must also be drawn to scale as well. Our tests so far have shown that measuring from satellite images is also accurate within a reasonable margin of error. However, at this time, we don’t recommend using this feature for areas larger than 4 square miles. Can I take vertical measurements? Currently, all measurements must be created on the ground surface. However, you can indirectly estimate the height of an object by first creating a ground measurement and then swiping up the green height bar until the height matches the object you are measuring. Will there be an Android Version available? In the future we would love to bring QuantifyAR to all mobile platforms, but there are no current plans to do so. If this is something you are interested in, please let us know!